This is really just an overview of the many different areas of motorsport I’ve worked in over the years. If it seems like an incomplete timeline, that’s because there have been periods of my life when I’ve had pretty-much no involvement … either focusing on my IT career, family or travel. Currently my IT and motorsport lives are overlapping. TRiPi(tm) is a full-featured Professional Stage Rally Tripmeter implemented on a tablet. It has two stopwatches, two distance recorders (odometers) measuring Kilometers or Miles, and an Official Rally Clock. Using the GPS sensors, which can determine position to within a few meters, the odometers are potentially more accurate than a tripmeter connected to the gearbox. Readings show hundredths of a kilometer/mile. They can show increasing or decreasing distances, and can have a preset starting distance. The stopwatches show tenths of seconds. They can be set to start from zero, from -1 minute (for use on a stage start line) or they can be set to start automatically as soon as vehicle movement is sensed. The clock can be adjusted to display Official Rally Time. 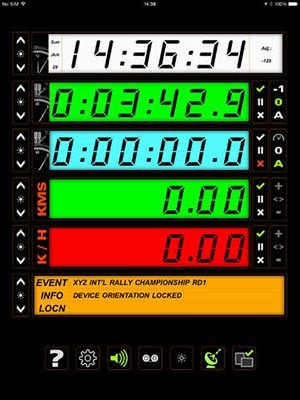 The bottom display is used to show the Rally Event name, useful information such as “No GPS Signal”. The current position can be displayed by tapping the GPS button. This button is color-coded to indicate GPS signal strength. The stopwatches and odometers are operated very simply, by tapping the display to start the meter, tapping to pause/restart, and swiped to reset. Each meter can be set to continue running in the background when the display is paused, or to stop with the display. All six meters can have their individual intensity adjusted, and reduced to zero if desired. Background and foreground colors can also be swapped. Every action is recorded and can be displayed in a table, by tapping the recorder button. TRiPi also has a full on-screen tutorial to demonstrate every feature of the app. It runs for approximately ten minutes, but can be stopped at any time. TRiPiLiTE(tm) is a small Professional Stage Rally Tripmeter implemented on a phone. It has a stopwatch, distance recorder (odometers) measuring Kilometers or Miles, and a clock. Using the GPS sensors, which can determine position to within a few meters, the odometer is potentially more accurate than a tripmeter connected to the gearbox. Readings show hundredths of a kilometer/mile. The stopwatch shows tenths of seconds. The current position can be displayed by tapping the GPS button. This button is color-coded to indicate GPS signal strength. The stopwatch and odometer are operated very simply, by tapping the display to start the meter, tapping to pause/restart, and swiped to reset. Each meter can be set to continue running in the background when the display is paused, or to stop with the display. All displays can have their intensity adjusted, and reduced to zero if desired. Background and foreground colors can also be swapped. TRiPiLiTE also has an on-screen tutorial to demonstrate every feature of the app. It runs for a few minutes, but can be stopped at any time. 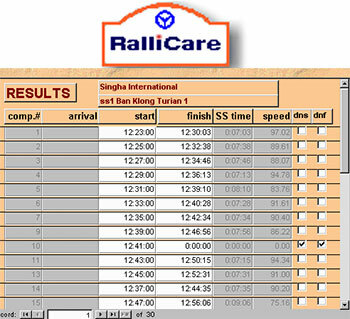 RALLiSERViCE(tm) is the perfect tool for Rally Team Managers and Coordinators to enable them to monitor the IN/OUT times of a Rally Car into the Service Park. 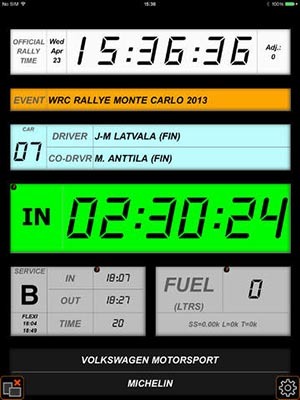 Connected to a large LCD TV or Monitor plus speakers, the app provides both visual and audible warning of scheduled arrival and departure times of the Rally Car. Once a rally’s intinerary has been entered from the Official Road Book, plus some other basic data – using the app’s setup screens – RALLiSERViCE will keep track of all of your team’s car’s scheduled service halts. Other useful data such as Fuel Requirements can be displayed. To keep your sponsors happy, their logos or names, plus the team’s name, can be rotated at the bottom of the app’s screen. ERA organized the Road to Mandalay Rally for vintage and classic cars. Over a twenty-five day period the event ran from Singapore, up through Peninsular Malaysia, around Thailand and across into Burma. 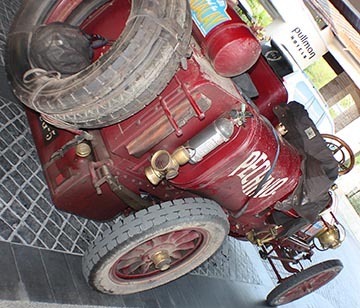 There were seventy entries, with the oldest being a 1907 Itala, which finished the event! I assisted ERA with some route planning, organizing Special Tests, and on-event marshaling. Team Management, Driver Training & Management, Sponsorship Procurement, Marketing, Event Management & Coordination; and at various times, Workshop Designer, Mechanic, Engine Builder & Tuner, and Floor Cleaner. During a five year period more than thirty people rallied with us, coming from France, Finland, N.Z., U.K., Japan, Hong Kong, Thailand and Canada, along with local crews in Malaysia. 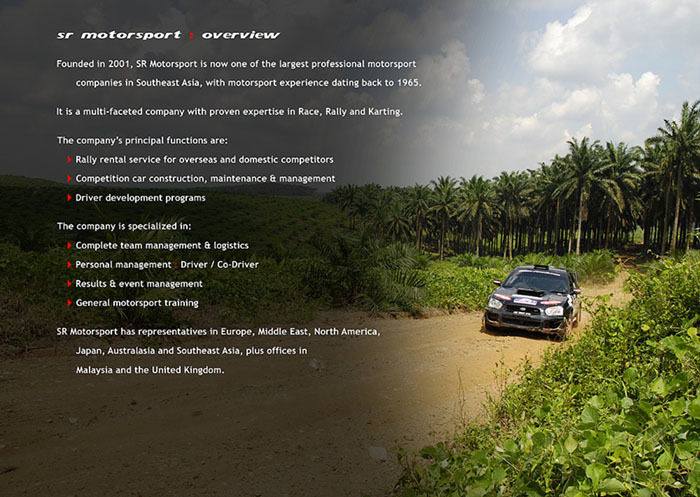 For a three year period I was Team Manager and a Director of Saladin Rallying Sdn. Bhd. The company was formed with the sole intention of supporting and promoting the rally career of young Malaysian rally driver Saladin Mazlan. In 2001 he competed in the inaugural Super 1600 Junior World Rally Championship, along with the likes of Sébastien Loeb. Initially the team rented a Ford Puma, but this seemed uncompetitive and so I switched him to a Citroën Saxo S1600, in which he scored points in Rally GB. For 2002 I negotiated the rental of an ex-works Hyundai Accent WRC, which Saladin drove in the Asia Pacific Rally Championship, becoming the first Malaysian driver to compete in a World Rally Car. My main roles were Event Logistics, Business Negotiations, Media Liaison, and Sponsorship Procurement. 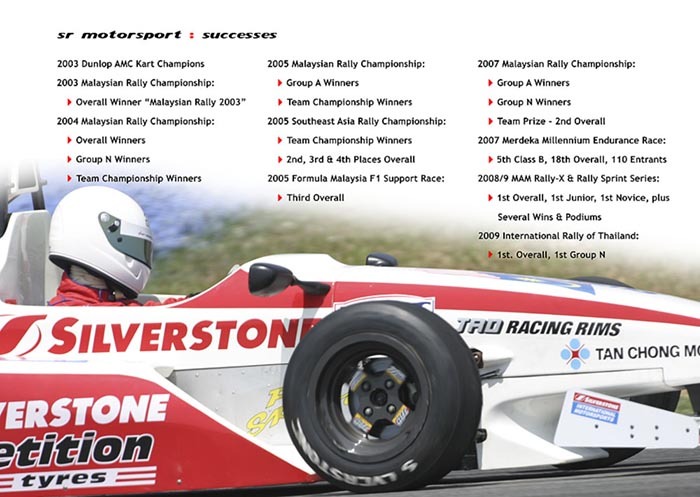 Autosport Malaysia was created as a non-profit company to support the development of grass roots motorsports in Malaysia. During its short life I acted as President & Board Member. Unfortunately the local ASN which represents the FIA refused to recognize the company as a valid event organizer. As a result, Autosport Malaysia’s only claim to fame was assisting with the route planning for the 2000 London-Sydney Marathon Rally. During the time I part-owned and operated IT company CMY Systems, we developed a product called RalliCare, which managed rally results. RalliCare was used not only in Malaysia (and still is) but around the world in places like Kuwait, Syria, Jordan, Thailand and Saudi Arabia. It is available for both traditional stage rallies and cross-country “raid” events. 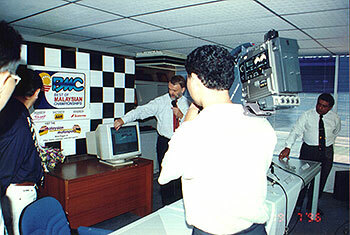 1996 – 2000 … MOTORSPORT ASIA LTD.
For a number of years I did on-event and behind the scenes contract work for Motorsport Asia Ltd. This is the company which organizes the Asian Festival of Speed events. Initially, work was related to website development, but later, on-event services included live web-based race results and reports, photography, interviews and other media work. Race weekends were certainly the most exciting aspect, but often involved sixteen hour days and extensive travel around Southeast Asia. 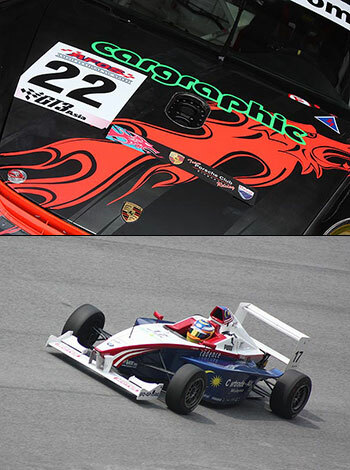 Malaysian Motorsports, included sections for everything that was happening in Malaysian motorsports… endorsed by AAM as the official site. For a number of years I acted as a “Circuit Officer” at the Shah Alam/Batu Tiga Race Circuit, assisting with a wide variety of events … not only race series, but rally sprints held on the land inside and around the circuit. As Team Manager/Co-Driver with the Midlands Rally Équipe in the UK we competed on several international events in the UK and continental Europe, especially in Belgium and Portugal. The team campaigned an ex-works Renault Alpine A110 acquired from the factory in Dieppe, France. My roles included Event Logistics/Coordination, Sponsorship Procurement and Co-Driving. In my early motorsport years I was active in many areas. As a private entrant in Road & Stage Rallies, Autocross, Hill Climbs, etc. I was an Event Organizer/Assistant on various club-level and national rallies. And if not competing or organizing, I could be found helping as a service crew member on international, national and club rallies.